The Syracuse Spartans are a group of elite baseball teams based out of Syracuse, NY. They are a product of Syracuse Baseball Prep, a baseball training organization started by Owner; JJ Potrikus, in 2012. 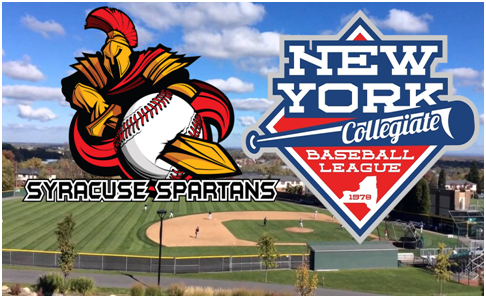 As we look to expand on our baseball opportunities, our organization is proud to announce that we are the newest program in the New York Collegiate Baseball League (NYCBL), with our inaugural season being this summer (2017). The NYCBL is a college baseball summer league affiliated with Major League Baseball. The Syracuse Spartans NYCBL Franchise will be led by field manager, James Williamson, the pitching coach for the baseball team at SUNY Brockport. JJ Potrikus is the team's General Manager and will be in charge of many of the off and on-field obligations. With this new team, it has created plenty of internship opportunities! The Syracuse Spartans are looking for hard-working and trustworthy individuals, preferably whom have a desire to enter the Sport Management field, to help us run our game day operations, ticket sales, and much more. It is a great opportunity to touch on many aspects of working for a team specific organization. Click HERE to Download our Sports Management Internship Flyer. The Syracuse Spartans are looking for social media and tech savy individuals, preferably those who have a desire to enter the Marketing/PR fields, to help us get the word out on the latest NYCBL Spartans news and updates! It is a great opportunity to touch on many aspects of working for a team specific organization, and bettering your understanding of marketing in athletics. Click HERE to Download our Sports Marketing/PR Internship Flyer. The Syracuse Spartans are looking for individuals who are passionate about baseball, preferably those who have a desire to enter the Sports Broadcasting field, to help us with our color commentary, game feed opportunities, in-game announcements, and much more. It is a great opportunity for those who are interested in being the voice of a sports franchise! Click HERE to Download our Communications/Broadcasting Internship Flyer.